“Balmerol” logo, and newly developed technologies – DEKATROL for Diesel Engine Oils and WOWtech for the two wheeler oils – were also introduced. 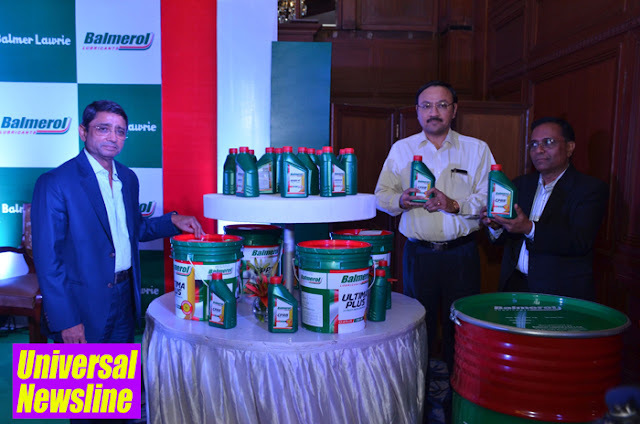 The new packaging was launched by Mr.Viren Sinha, Chairman & Managing Director, Balmer Lawrie in the presence of Directors, senior officials, key customers, dealers and distributors. The Company aims at doubling its market share in the lubricants space in the next 5 years. The new TechTonic packaging symbolises the technological advancement achieved with the use of the exclusive “DEKATROL” and “WOWtech” technology, which act as a “tonic” for today’s high tech engines. The packaging along with the revamped logo looks contemporary and modern. The Company's R&D Centre, known as Application Research Laboratory (ARL) located at Kolkata developed the tribological solutions using the unique "DEKATROL technology" which has a ten point advantage, is eco-friendly, helps to reduces frictional energy losses, and enhances fuel economy as also the life of the product. The solutions developed using “WOWtech” technology provides extra protection and acts as strong shield for the engine, clutch and gear. Speaking on the occasion, the Chairman & Managing Director, Mr Viren Sinha said that the Company is constantly working on providing best in class environment friendly tribological solutions, which are at par with competition. He reiterated that automotive retail business will continue to be the focus, which will drive growth and profitability. Balmer Lawrie is rapidly expanding the distribution network in both the Industrial and Automotive retail segment in focused markets ably supported by a strong marketing campaign and brand building exercise. Balmer Lawrie was Founded by two Scotsmen, George Stephen Balmer and Alexander Lawrie, in Kolkata, Balmer Lawrie& Co. Ltd. started its corporate journey as a Partnership Firm on 1st February 1867. Today Balmer Lawrie is a Miniratna I Public Sector Enterprise under the Ministry of Petroleum & Natural Gas with a turnover of Rs 2843 crores and a profit of Rs 220 crores. Balmer Lawrie is a much-respected transnational diversified conglomerate with presence in both manufacturing and service sectors. With a rich heritage of nearly 150 years, its first grease plant was built at Kolkata in 1937. It is a market leader in Steel Barrels, Speciality Greases & Lubricants, Travel & Vacations and Logistics.